1. Preheat the oven to 350 degrees. Line two baking sheets with parchment paper. 2. In a medium bowl, mix the butter, sugar, flour and vanilla extract until smooth. Once thoroughly combined, add the rolled oats. 3. Drop teaspoons of dough, two inches apart, onto baking sheets. Slightly flatten the dough to ensure that the cookies come out thin. 4. Bake until golden for 12-15 minutes. After baking, cool the crisps for 15 minutes. 5. For the cream, bring an inch of water to boil in a medium saucepan. 6. Combine the egg white, sugar, water, and vanilla extract in a small bowl. 7. Over the boiling water, beat the cream thoroughly. 8. Cool the cream for 10 minutes in the refrigerator. 9. Once the cream and the oatmeal crisps are cool, sandwich a teaspoon of cream in between two crisps. 10. Allow the assembled sandwiches to cool in the refrigerator for an additional 10 minutes. These dainty sandwiches will surely satisfy your sweet tooth without being overpowering. 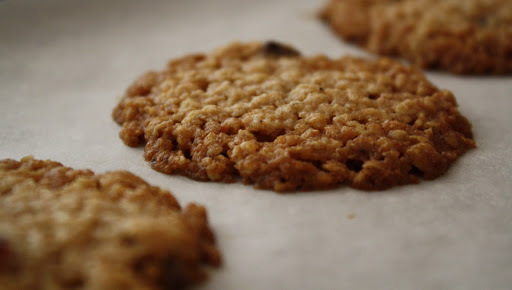 I love the contrast between the crunchy oatmeal and the airy vanilla cream. While on spring break, I am excited to devise more delicious recipes to share with you all. Enjoy!